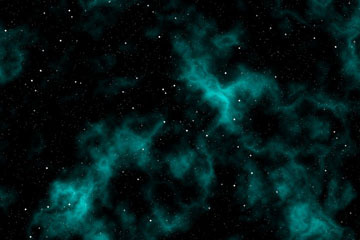 Create your own space backdrop, with stars and gas clouds. This tutorial explores the methods to make an interesting nebulous starfield, similar to the image on the right. This image was created in under 15 minutes, and once you understand the process, you can achieve entirely different and unique images in less than 5 minutes. 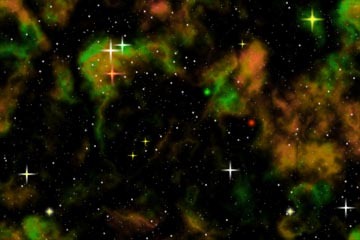 I will use methods I've learned and explored in other tutorials, such as "Creating a Star Field" and "Creating a Deep-Space Star Nebula" by Luke Ahearn at the Digital Game Developer website, but I will go above and beyond these by including methods for making nebulous clouds and more interesting stars. I am using Photoshop 5+, but I imagine similar methods are available in other software packages. 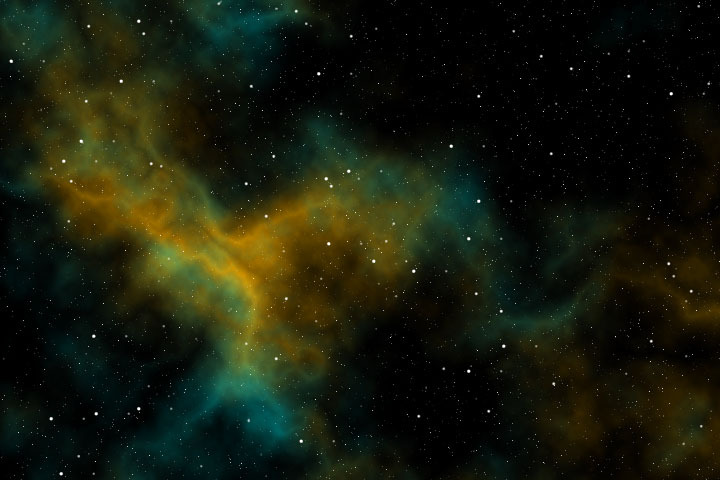 In this tutorial I will make a background star field with various star sizes. I will then explain methods I use to make nebulous clouds. 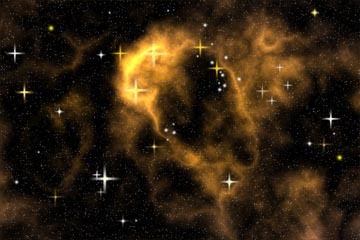 Lastly I will explain how to use brushes to make additional stars and starbursts. 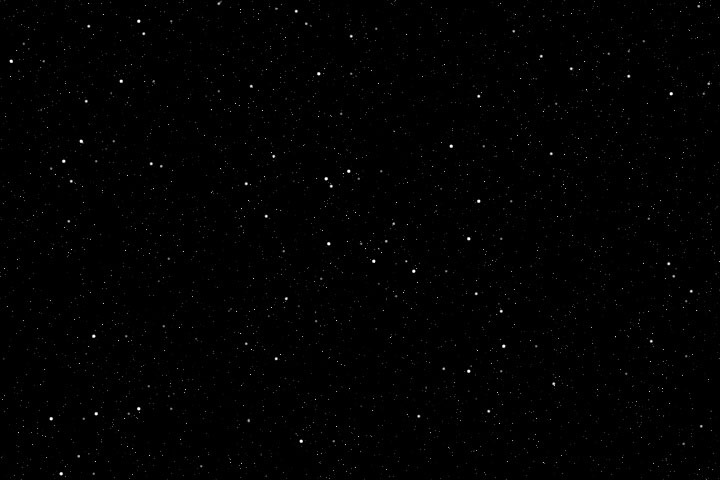 To create a general star background, I use basic filters. Start with a new image and make it black. I started an image using resolution of 720x480 so some settings I use may need adjustment if you use different resolution. 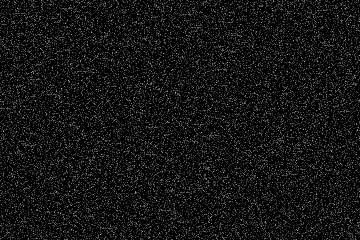 Add noise to the image. In Photoshop, I use the Noise Filter at about 20%, Gaussian, Monochromatic. I've found good results with noise between 5% and 40%. 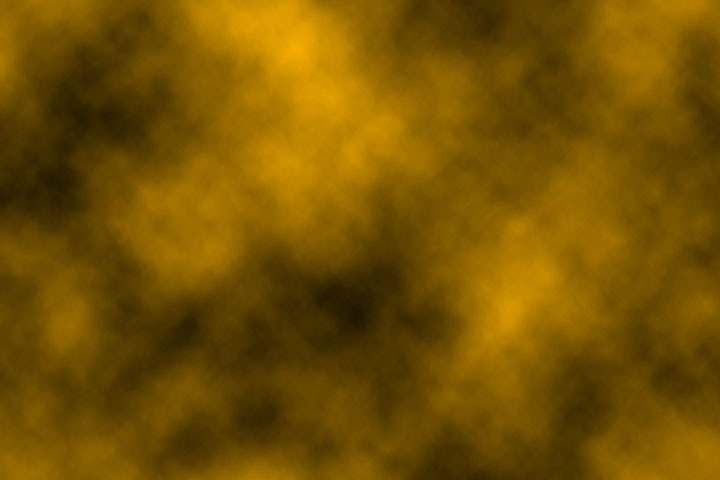 This image is Noise as it appears in Photoshop 6. Adjust the Brightness and Contrast of the Star Background layer to bring out some stars. I adjusted the Brightness to around -90, and the contrast to about +40. Good results can be achieved by applying Brightness and Contrast of different values multiple times. Now duplicate this layer. Select the duplicate layer, and adjust the scale by selecting Edit>Transform>Scale. Increase the scale of the overlapping image to somewhere between 200% and 500%. Now change the layer blending mode to screen. 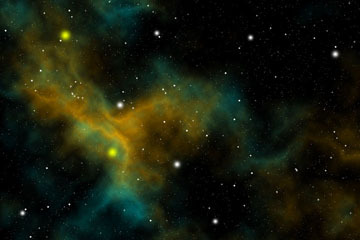 The additional layer will add larger stars to the image. 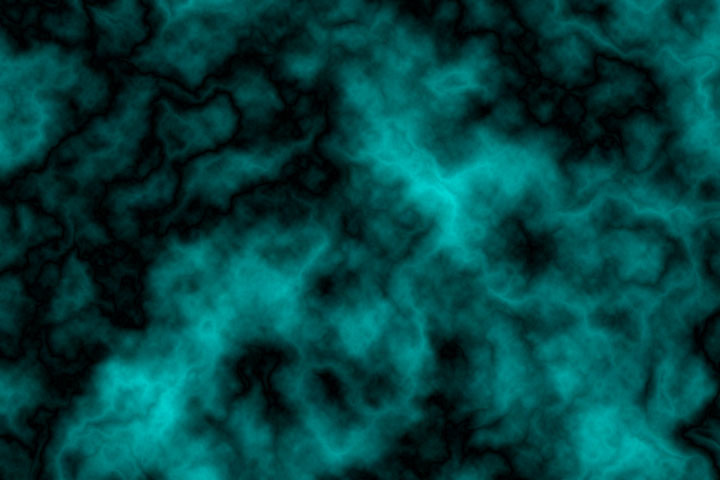 Now we will create some interesting nebulous clouds using one of my favorite filters, Clouds. First decide on the main color of the nebulous clouds. In this case I chose a light blue. Be sure the background color is black. On a new layer render clouds by clicking Filter>Render>Clouds. 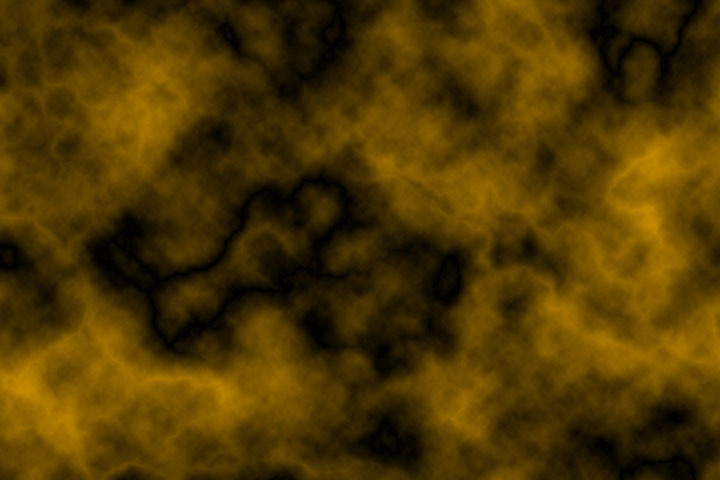 Now I create a more interesting and defined shape by using difference clouds. Do this by clicking Filter>Render>Difference Clouds. I apply this multiple times (Ctrl-F to repeat last filter) until the clouds shape become more vein like. Essentially, we want the darker area of the cloud layer to be transparent. To do this we change the blending option to Screen. 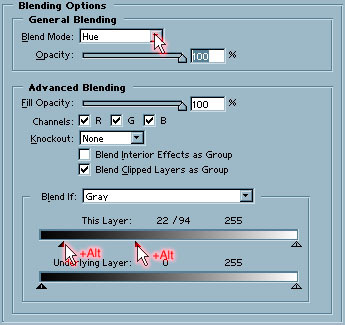 But this isn't enough, we want to adjust the blending using the advanced blending options. By adjusting the slider icon on "This Layer", we can adjust the range of transparency, effectively controlling the range that darker pixels are dropped from the layer. Additionally, by holding the Alt key and clicking and dragging on one half of the slider icon, we can adjust the range of partially blended pixels. I adjusted the transparency on "This Layer" by adjusting the darker, left hand side, sliders to 25 and 145 as shown in the image below. 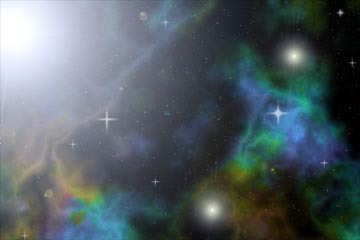 The resulting image shows the breakthrough of the star layer below the cloud layer. Adjust blending to your liking. Adjust the compliment cloud layer similar to the main cloud layer. But change Blending type to Hue, and adjust the "This Layer" blending. Your main cloud layer become more interesting. Adjust the compliment cloud layer to you liking. Sometimes, I like to link the Main Cloud (Cloud Screen) and Compliment Cloud (Cloud Hue) layers together and zoom into a focus area using the transform scale option. In this case, I focused on a particularly interesting area of the clouds. I used the Free Transform option to zoom and place the cloud layer how I wanted. Free Transform can be applied by hitting Ctrl-T or by clicking Edit>Free Transform. 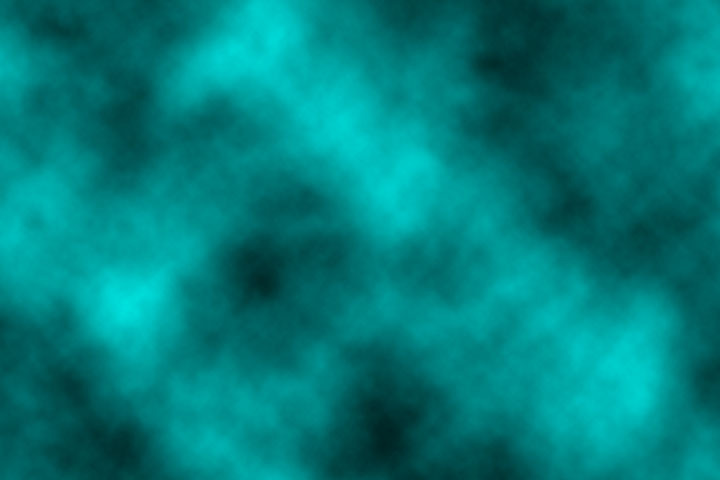 Zoom to a focus area of the clouds by using Free Transform. Note: because of the transform scales, the file size and memory requirements for the file will become larger. To improve performance and reduce file size you may want to remove the parts of the image that exist outside the viewable Canvas. To do this we will crop the image. First choose Select>All (or hit Ctrl-A) and then select Image>Crop. Now add an additional layer. On this layer we will use various brushes make additional stars. Initially, I use the smaller brushes and set color to white or yellow (star color is up to you). 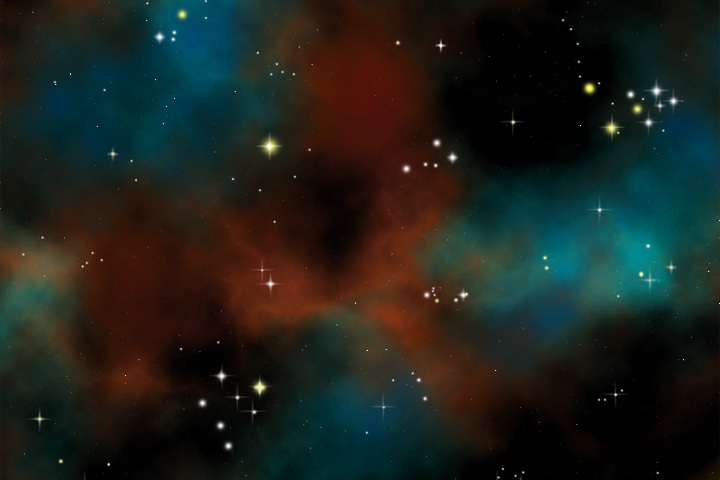 On the new layer, set the brush fade to 1, and start adding stars using various soft round brushes. 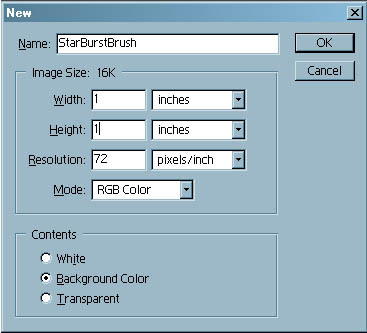 Now we will create some custom brushes to add starbursts to some. Start a new image and set its size to 1 in by 1 in. On the Background layer, draw a thin plus sign. Add an additional layer and use the Radial Gradient fill (or use a soft circular brush if you'd rather) to make a blurred dot. Set the blurred dot layer to Multiply. Merge the layers by clicking Layer>Merge Visible. I recommend blurring the starburst image. I used the Blur More filter twice. Now select the entire 1in by 1in area (Ctrl-A) and define it as a new brush by selecting Edit>Define Brush. I repeated this process multiple times, each time I reduced the image size by 12 pixels until I had five new starburst brushes. 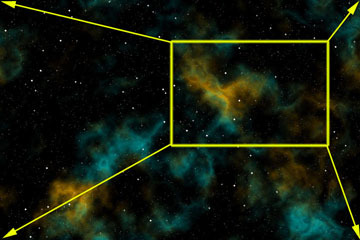 Now use the brush tool with these new bruses and daub them over the stars already in the image. That is it. Now that you understand the process, you should be able to create interesting starscapes in no time.